What’s the first thing that comes to mind when you think of cryptocurrency? Decentralization? Anonymity? Future? Investment? How about something like risk, doubt, volatility or even speculation? Let’s be honest and admit that all the positive associations mentioned above always come in tandem with some negative. Since the whole crypto industry is pretty young, a degree of risk cannot be avoided by any crypto enthusiast entering the market, whether it’s a big investor or a beginner. As the market develops so does the currency. One of the latest trends among the crypto community which is believed to stabilize the market as well as attracting new crypto followers is stablecoin. In this close-up, we will define the stablecoin term itself, find out its strengths and weaknesses, summarize its worth and will try to predict its future. What is stablecoin and why is it so popular? Thus, stablecoin mirrors the price of asset it is pegged to. In other words, if stablecoin is backed by USD fiat currency it tracks the rate of USD, while stablecoin backed by EURO or, let’s say gold tracks the price of EURO and gold respectively. The other type of stablecoins is called algorithmic stablecoins. Its distinctive feature is that such stablecoins are not backed by collateral assets, anyway algorithmic stablecoins prove to be stable. The price stability, in this case, is achieved by integrating monetary policy in smart contracts. The implemented algorithm is increasing and decreasing supply to keep the coin’s value close to the value of the hard asset it is pegged to. Hence, the algorithm plays the role of a reserve bank. When investing in traditional cryptocurrencies, it is of first importance to distinguish between speculative projects and true utility projects. That’s the most challenging and risky quest when entering the crypto space as the market is oversaturated. And the reason for keeping one’s funds in stablecoins is — there are very few available on the market to date, and their price closely tracks the price of a stable asset it is pegged to. Though there’s still a choice to be made. We asked opinion-leaders in the field of stablecoins to share their views on the most hot-spot questions around the new-generation crypto assets. The first frontman of the stablecoin movement, who shared his view is Gregory Klumov, CEO & Founder at STASIS — the stablecoin known as EURS backed by EURO fiat currency. You can exchange 130+ cryptos for EURS in a few clicks on Changelly. Gregory, as you probably know there are a lot of different opinions around stablecoins. Some market leaders call it a new bitcoin, while prominent economists express their doubt with this subject. How do you consider the row of stablecoins to date across the crypto industry and globally? Right now, stablecoins are primarily being used by investors and traders to move wealth in and out of the cryptocurrency market much more efficiently than if they had to use fiat currency. Stablecoins can also be used to provide access to a stable store of value for people in places with volatile national currencies. As dApps and other parts of the blockchain/cryptocurrency ecosystem continue to develop, there’s a good chance that stablecoins will become the currency of choice for transacting within the ecosystem, because they are better able to meet the functions of money: a means of exchange, unit of account, and store of value. Bitcoin plays a different role in the market, because it can be expected to significantly increase (and sometimes decrease) in value over time, making it more of an investment asset than an everyday means of exchange. Do you believe some stablecoin can move BTC from the leading market position with time? While bitcoin may eventually be surpassed by another token in terms of market cap and/or trading volume, stablecoins will not be the reason for this. Stablecoins allow investors to enter/exit positions in the cryptocurrency market much faster, and with lower fees, than if they were moving back and forth between fiat and crypto. This makes trading much more efficient, but this efficiency is equally available for those trading bitcoin or any other speculative digital asset. Do you believe the specificity of stablecoins can catalyze its mass adoption much sooner than other cryptocurrencies? Yes. Because they don’t have the volatility of other cryptocurrencies such as bitcoin or ether, stablecoins are better suited for everyday use cases such as paying for goods or services or paying fees on blockchain-based applications. However, stable cryptocurrency is not the only thing needed to bring about mass adoption; there is still much work to be done in terms of developing the applications and payment infrastructure needed for mass adoption. Can you name three reasons why should one invest, or at least pay close attention to stablecoins? Stablecoins provide access to the benefits of crypto such as security, transaction speed, and a public, immutable ledger, while protecting investors from the market volatility of other cryptocurrencies. Because they provide a reliable store of value on the blockchain, stablecoins enable a safer, more reliable flow of capital throughout the blockchain ecosystem. Over time, this will help catalyze the development of the entire ecosystem. Because stablecoins provide globally-accessible synthetic access to reliable national currencies, they will likely hold special appeal for people in nations with failing monetary policy, providing investors with a means of doing business with people outside the typical financial/commercial hubs. 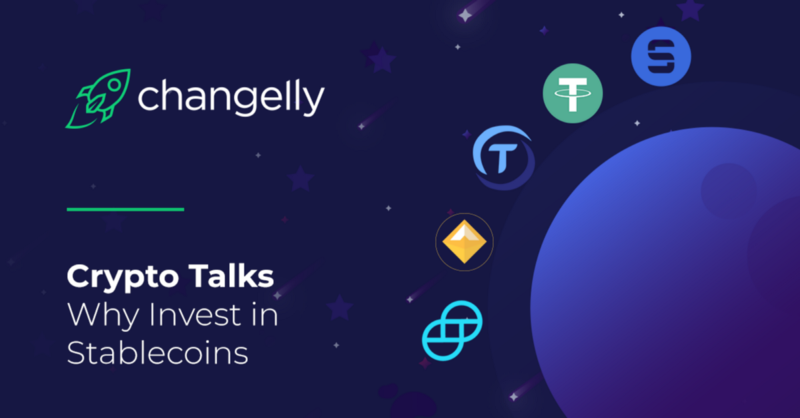 Another prominent figure in crypto space who shared his expert view on the stablecoin situation is Stephen Kade, Co-Founder of TrustToken or TrueUSD — the stablecoin backed by USD fiat currency. You can easily swap your crypto for TUSD by following the provided link. So, Stephen, how do you consider the row of stablecoins to date and which role will it play for the crypto industry in the future? Stablecoins are a long-awaited stable trading instrument for cryptocurrency traders. They will enable consumers and businesses to finally use a cryptocurrency as a medium of exchange. Stablecoins and BTC fulfill different functions for traders. BTC’s main value proposition is as a store of value– some call it “digital gold.” It has long transaction times and a volatile price, so it’s difficult to use BTC as a medium of exchange. Stablecoins are designed to be used as a medium of exchange. Think about how people buy gold or equities as investments, and then use cash or credit cards for day-to-day purchases. Both are important building blocks for the digital economy. Through stablecoins, everyday people and businesses can enjoy the benefits of digital currencies (faster transaction speed than ACH, global access) without the volatility of Bitcoin. Now you can pay salary, take out a loan, or buy coffee with a cryptocurrency, enabling a new economy of cryptocurrency financial applications. Many blockchain applications, such as loans, salaries, and prediction markets, will require a stablecoin to facilitate payments between users. Stablecoins can eventually be used for remittances. Some developing economies are increasingly reliant on cryptocurrencies for trade. Stablecoins will be heavily used by traditional financial institutions entering the crypto industry. Our stablecoin TrueUSD uses a legal vehicle they’re familiar with (escrow accounts), to enable them to make safe trades in the crypto markets. You are welcome to read the full version of the interview with DAI by following the link. Let’s do an interview with Changelly! Whether you are a founder of a crypto project or a crypto blogger — contact us at [email protected] and share your thoughts on the hottest topics in the wonderful crypto space!